Concrete repair to keep municipal operations running smoothly. City and county operations are often under the radar for most residents. And that's the way it should be. Your job is to keep building ramps and staircases accessible, to keep water facilities flowing and to ensure runways and roadways are ready for travel. Our job is to ensure you can do that with minimal downtime for residents and maximum savings to your budget. Commercial Concrete Solutions’ concrete technology allows you to repair rather than replace your most critical concrete surfaces. Just when you think you’ve tackled every repair under the sun, you get a call from the Kansas City Zoo. They needed a quick solution for their elephant enclosure because the elephants were rubbing their tusks on the concrete causing it to break and chip off. 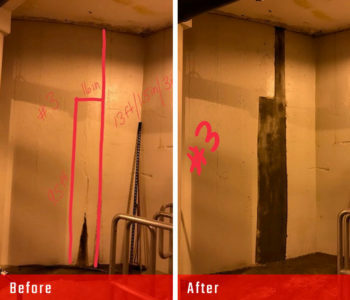 CCS performed a vertical concrete repair and in less than four hours the elephants were back in their enclosure. They say an elephant never forgets. We hope the KC Zoo never forgets they can rely on us to minimize downtime and keep their animals (and zoo-goers) safe. A water treatment facility is the lifeline to any city, town or county. When Wyandotte County’s clarifier tanks started leaking, an urgent solution was necessary to keep operations running. CCS’s special crystalline sealant was the perfect solution. 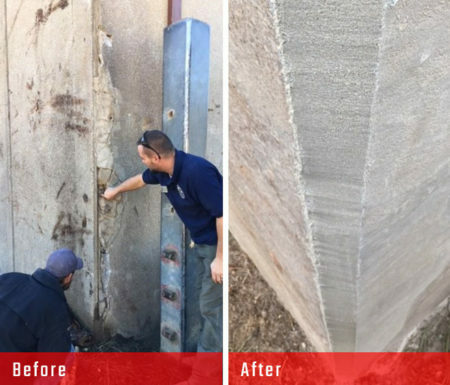 Wyandotte County was able to drain one tank at a time to allow CCS to complete a vertical repair using their crystalline water proofing system. The CCS team was able to repair both water tanks in two days. The RideKC Streetcar has quickly become an icon of downtown life in Kansas City. 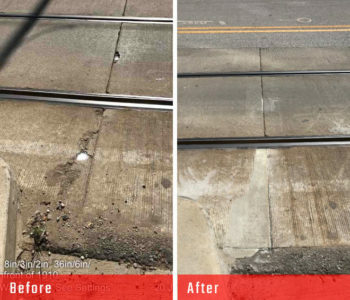 When spalling along the track system started to show, Herzog Transit Services, Inc. called on CCS to perform spall repairs, fix potholes and ensure proper color matching for each repair. To ensure passengers never skipped a beat, our team worked overnight for four nights to keep the project and the streetcar moving.